The Edward Harris House Inn is proud to be designated as a historic National Registry structure. From the beginning, we chose to restore this beautiful structure for others to enjoy in the years to come. We are thankful for your interest in preserving this historic 1896 Rochester jewel. 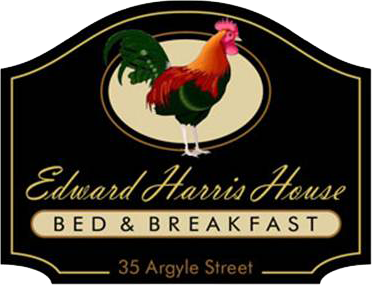 For the care and comfort of all our guests, The Edward Harris House has adopted the following policies. Published rates may be changed without notice and may vary according to availability, holidays or special events. Prices do not include 14% NYS sales and local room taxes. Inn Rooms: A valid credit card will hold your reservation, with payment collected upon arrival at the Inn. Special Events: During special events; (college weekends, graduations, weddings, elopemenst or whole house rentals)- a minimum 50% deposit on a credit card is required upon reservation. Event Balances must be paid in full 30 days prior to arrival for the Inn or Cottage. College weekends in May are payable by Jan.1 prior to your stay. Please contact the Inn for further information. Note: Gift certificates and discounts may not be available as payment during our high season (May 1 – October 31,) or on special event or college weekends. When planning your stay, please remember that taxs on gift certificates are additional. A $5 per day service fee is placed on all gift certificates or coupons. A two-night minimum stay may be required on major college event weekends and some special event weekends. The cottages have a three-night minimum. Check-in time is 3-7pm and Check-out time is 11am. To have staff available for your arrival, please contact us if you need to make other arrangements. Due to our insurance as well as the health and safety of our guests, we are a non-smoking facility. Smoking is permitted on porches and patio areas only. For those who smoke inside their rooms or common areas, a $150.00 fumigation fee will be charged to their account and the guest/s will be asked to leave the facility. The fireplaces in guest rooms are no longer available. Candle inserts and electric inserts have been added for your ambiance. However, during the season - if you would like to use the Library or Living room, a staff member will be happy to light a fire in the main floor fireplaces. (weather permitting). Thank you! For the comfort of your child and your fellow guests, we are able to accommodate young adults 12 years or older at the Inn. For young families traveling with infants, young children, or pets - we would recommend our family friendly cottages, or would be happy to recommend local accommodations that would be well suited for your family. Alternate on street parking as well. We regret we are unable to accept pets. Please be aware that there are two friendly 'hypoallergenic' dogs on premises. (A Maltese named Havana, and a Havanese named Fidel ). If you have a furry friend that likes to tag along, make a reservation for some serious pamering at Canp Bow Wow located at 85 Mushroom Blvd. Rochester, NY 14623 phone: 585-613-WAGS (9247). They love to pamper! Cancellations 7 days prior to arrival will receive a full refund, (45 days for holidays and special events). Cancellations received less than 7 days in advance will be charged a one night charge and a $35 service fee. Cancellations received less than 48 hours or less are non-refundable. If rooms are not claimed by 7pm on the day of scheduled arrival, guest will be responsible for the full amount (plus a $35 service fee) to be charged to guests account. All changes or cancellations may be subject to a $35 service fee. We understand that unforeseen situations may cause you to change your plans, and we will do our best to re-let your rooms for you, refunding the full amount (plus a service fee). Guests checking out early will be responsible for any unused rooms/days. Prices subject to change without notification. b. The NYS Thruway is closed due to poor travel conditions. Please note: For your proctection and ours - reservations are not considered canceled without receiving a cancellation number. Please contact the Inn directly to receive this number for your records.